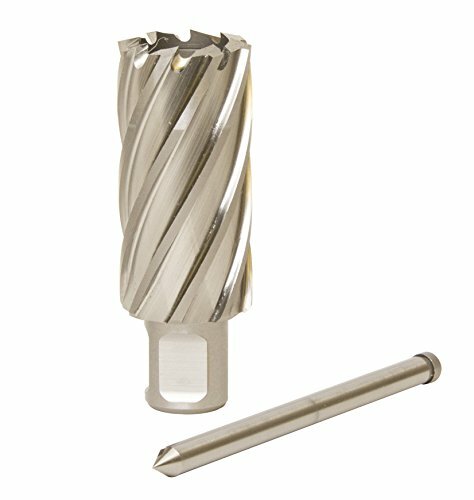 Evolution annular cutters save time and energy when compared to twist drills. By cutting only the periphery of the hole, annular cutters produce a reamed, finished, burr-free hole. No pre-step drilling is required; holes are cut in as little as 15 seconds. The CC6SET1 includes six 1-Inch cutters with diameters of 9/16-Inch, 5/8-Inch, 11/16-Inch, 13/16-Inch, 15/16-Inch, and 1-Inch all within a specially made carrying case. Using a unique patented geometry and high quality steel will exceed competitors capabilities in durability by 65 percent and in speed of cut by 35 percent . Thanks to made in the USA manufacturing in davenport, IA slugger Cutters are recognized for the brand name that says quality. Cutters are made to cut cleanly through steel with positive slug ejection. Cut clean, bur free holes. The Steel Dragon Tools 3/4-inch high-speed steel annular cutter. This bit will quickly and safely cut holes in steel. This bit has a 2-inch cutting depth with a 3/4 in. Weldon shank. Steel Dragon Tools 3/4-inch high-speed steel annular cutter. Machine-finish hole with no reaming needed when using lubricant. The Brown & Sharpe 599-792-2 Edge Finder is made from Hardness Rockwell C (HRC) 58-rated steel for increased durability, and is fully hardened and precision ground. It features a 3/8 shank and 0.200 head diameter. It can locate round or flat work to within .0005 accuracy, and is rated up to 1,000 RPM. Single-end usability allows use on one end of the instrument. 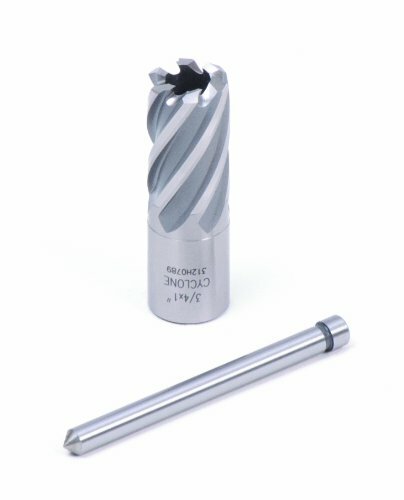 Place in a standard 1/2 diameter collet or chuck to use, and as it rotates and approaches the work edge, the head moves sideways approximately 1/32 . The center of the finder is exactly half the head diameter away from the work. 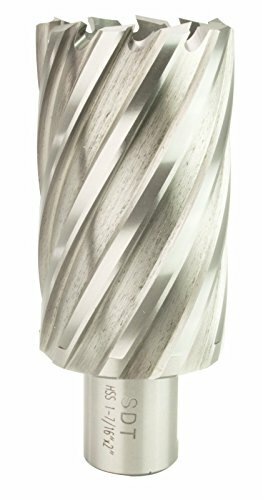 Evolution Cyclone Premium High Speed Steel Annular Cutters are designed to offer the highest value in annular cutter technology. 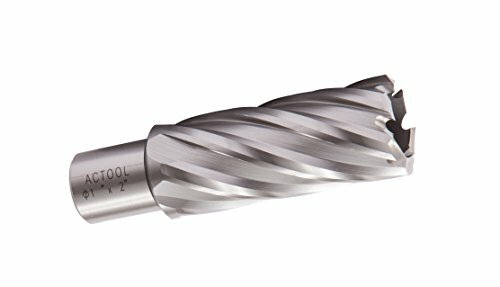 Made with premium M2AL composite, Cyclone Cutters last longer, allowing more holes cut per dollar compared to standard annular cutting bits. The free included pilot pin saves the user time and money from having to find the correct accessory pin. Distinctive gold bits, bearings and pivot pin signify the longest lasting, fastest cutting, easiest adjusting solution for cutting holes in sheet metal. Our hole cutters quickly install into the chuck of any corded or cordless drill as small as 1/4 In. (6.4 mm). Lightweight aluminum frames make these accessories extremely portable for a variety of hole cutting applications in sheet metal including 20-gauge (1.02 mm) galvanized steel. 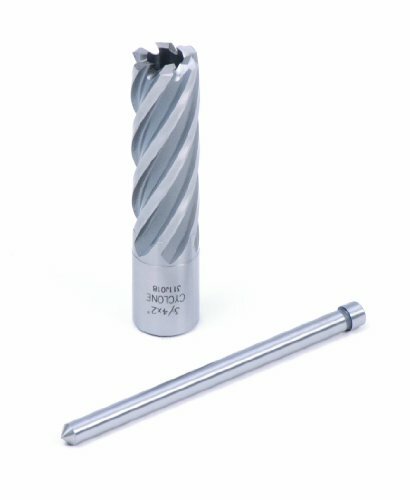 1) ACTOOL HSS annular cutter, with unique types geometry and random-space tips provide clearly cutting, fast feed rate, less vibration, smooth hole surface and long tool life, the effective of drilling is much better and quicker than the common drills. 2) ACTOOL HSS annular cutter has the advantage of being durable and super tough, due to the fine, well-distributed and micro carbide structure. A long life tool 3) ACTOOL HSS annular cutter can be used on all kinds of magdrills like Nitto, Hougen, Jancy, Alfra, Ruko; As well as drilling machine and electric drill in rotary mode and all kinds of drilling presses with all types of shank. 4) The cutters' diameters is 20mm-100mm. The cutting depth is 25/50/75/100mm. It can be widely used in drilling steel, copper, aluminum, stainless steel and plastic, in either plate or pipe form. The Steel Dragon Tools 1-7/16-inch high-speed steel annular cutter. This bit will quickly and safely cut holes in steel. This bit has a 2-inch cutting depth with a 3/4 in. Weldon shank. SDT annular cutters will drill large holes up to ten times faster than regular drills bits. Bit Size: 1-7/16 in. Cutting Depth: 2 in. 3/4 in. Weldon Shank Machine-finish hole with no reaming needed when using lubricant. Make overlapping holes, slotting holes, and edge cuts. Bit size is etched on each cutter. Steel Dragon Tools 1-7/16-inch high-speed steel annular cutter. Cutting Diameter: 1/2", 9/16", 11/16", 13/16", 15/16" &1-1/16"
Fits: Core hole drilling fields such asengineering,rail transit, bridges, ships, machinery manufacturing, aerospace,mild& structural steel,aluminum,stainless steel (lower BHN)and cuts only agroove at the periphery of the hole and leaves a solid core or slug at the center. 2. "Weldon shank" annular cutters have 2 flats andfix in the chuck by tightening Grub screws in the two flat areas. 3. Insert the ejector pin inside the annular cutter,never use an annular cutter without an ejector pin.Fill the coolant tank with BDSlubricant,never use the machine without lubricant. 1. Make sure the product is correct when youfirstly receive it,any problem please feel free to contact us. 2. Remember to protect yourself, especially eyeswhen working with it. 3. We also have 13pcs annular cutter set (ASIN:B07K2V1NQR)and single annular cutter, if you need, just search on our shop,many sizes can be chosen. The annular cutters are compatible with almost all major brands of magnetic drills, can also be used with machine tools such as mills and large drill presses with tool holders. Made of tough high speed steel material, with longer service life and high heat resistance. Applicable materials include wood, various steel materials,steel plate, aluminum, brass, cast iron, Stainless steel of lower BHN.,etc. 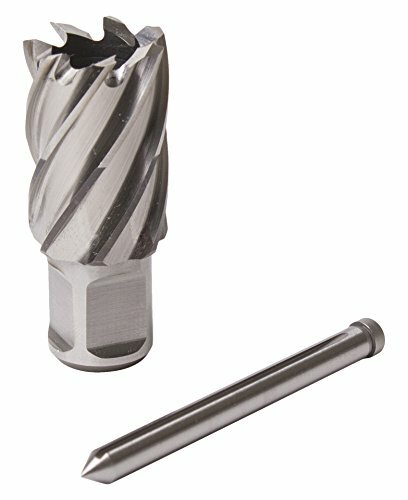 The biggest advantage of HSS annular slugger drill cutter bits is its ability to re-sharpen and burr-free holes and smooth holes, resulting in less scrap and wastage of material,has higher accuracy and multiple cutting edges for ply-cutting and lower friction to reach better performance of endurance and removal of chips. Fits: Core hole drilling fields such as engineering,rail transit, bridges,ships, machinery manufacturing, aerospace,mild & structural steel,aluminum,stainlesssteel (lower BHN)and cuts only a groove at the periphery of the hole and leavesa solid core or slug at the center. 3. Insert the ejector pin inside the annular cutter,neveruse an annular cutter without an ejector pin.Fill the coolant tank with BDSlubricant,never use the machine without lubricant. 1. Remember to protect yourself, especially eyeswhen working with it. 2. We also have 6pcs annular cutter set (ASIN:B07B2TQCJY)andsingle annular cutter, if you need, just search on our shop,many sizes can be chosen. 1.The annular cutters are compatible with almost all major brands of magnetic drills, can also be used with machine tools such as mills and large drill presses with tool holders. 2.Made of tough high speed steel material, with longer service life and high heat resistance. 3.Applicable materials include wood, various steel materials,steel plate, aluminum, brass, cast iron, Stainless steel of lower BHN.,etc. 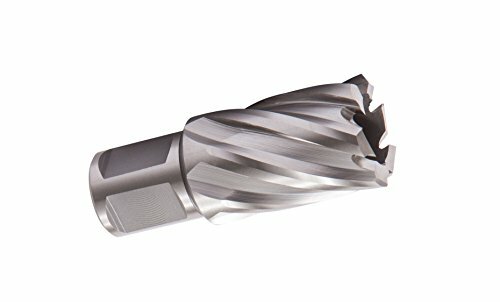 4.The biggest advantage of HSS annular slugger drill cutter bits is its ability to re-sharpen and burr-free holes and smooth holes, resulting in less scrap and wastage of material,has higher accuracy and multiple cutting edges for ply-cutting and lower friction to reach better performance of endurance and removal of chips. 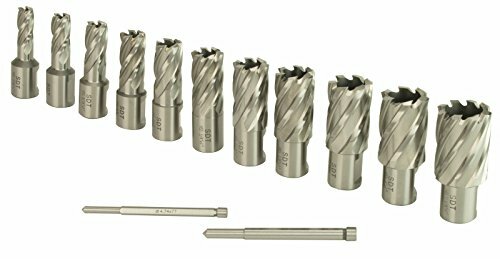 5.Includes 11 cutters ( Cutting Diameter:7/16,1/2,9/16,11/16,5/8,3/4,13/16,7/8,15/16,1,1-1/16), 2 pilot pins (4.74x77mm,6.35x77mm) & 1 plastic tool carrying case. 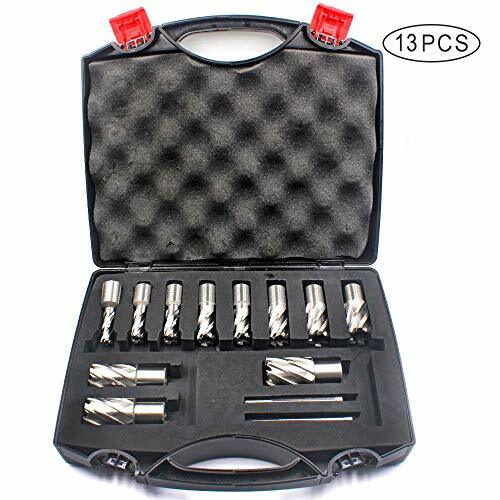 Steel Dragon Tools 13pc. High Speed Steel HSS Annular Cutter Kit 1" Depth and 7/16 in. to 1-1/16 in. 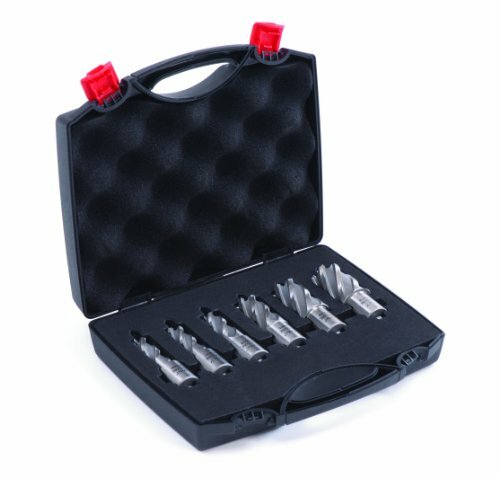 The Steel Dragon Tools 13-piece high-speed steel annular cutter kit includes 11 annular bits and two (2) pilot pins. These bits will quickly and safely cut holes in steel. The bits have a 1-inch cutting depth with a 3/4-inch Weldon shank. Bit sizes included: 7/16 in., 1/2 in., 9/16 in., 5/8 in., 11/16 in., 3/4 in., 13/16 in., 7/8 in., 15/16 in., 1 in., and 1-1/16 in. Kit includes 11 high-speed steel annular cutters and two (2) pilot pins. Bit sizes included: 7/16 in., 1/2 in., 9/16 in., 5/8 in., 11/16 in., 3/4 in., 13/16 in., 7/8 in., 15/16 in., 1 in., 1-1/16 in. Cutting Depth: 1 in. 3/4 in. 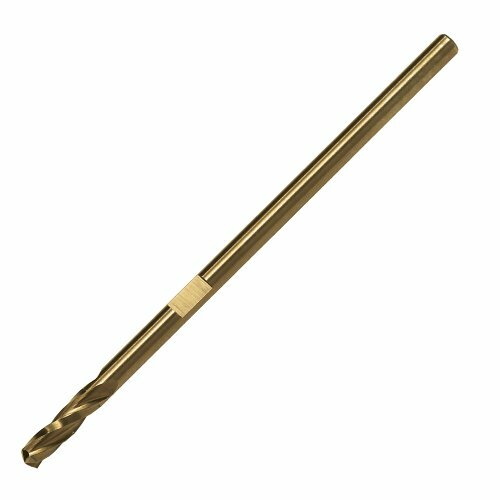 Weldon Shank Pilot Pin: 3/16 in. x 3 in. (4.74 mm x 77 mm) Pilot Pin: 1/4 in. x 3 in. (6.34 mm x 77 mm) Includes carrying case. 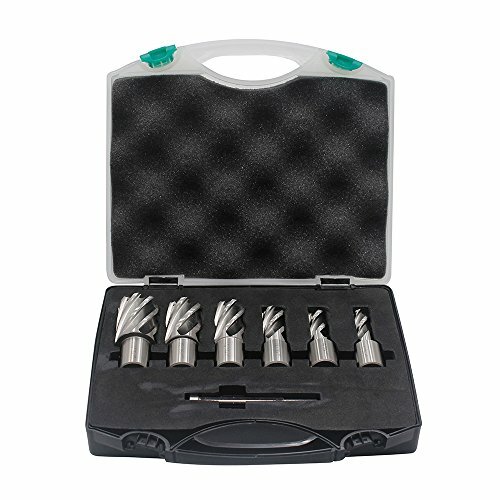 Kit includes 11 high-speed steel annular cutters and two (2) pilot pins.